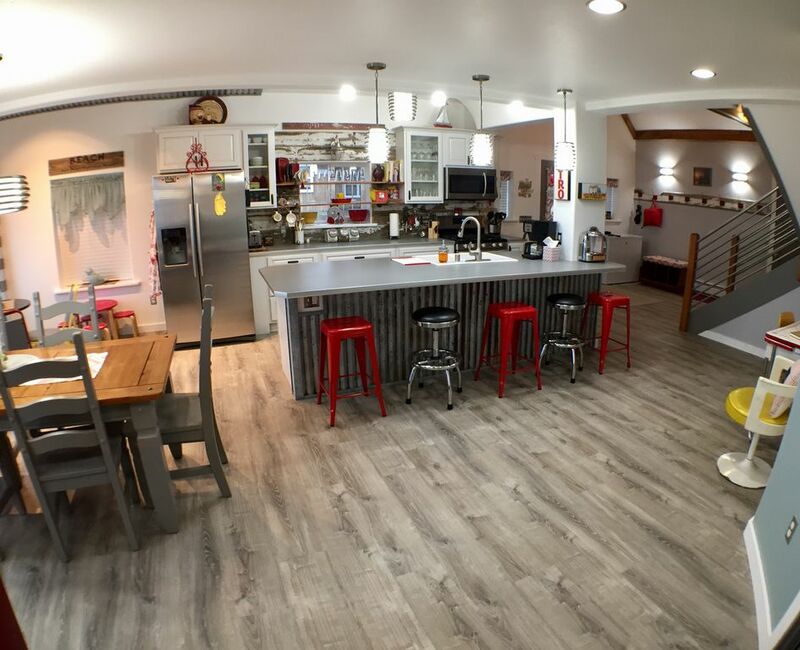 Remodeled 1800 sqft, 3 Bedroom w/ Loft, 2 Bathroom Family Home. Handicap access. An original home built in Old Town Kenai, Jetty Petersen's historic hand-hewn log home with dovetailed corners was built in 1940 and is on the Alaska historical registry. With an original exterior and completely remodeled interior, this home has spectacular and unobstructed views. Views of the world-famous Kenai River, the Pacific Ocean’s Cook Inlet beach, and the active volcano, Mount Redoubt, can all be seen from the four large picture windows of the living area. Eagles, beluga whales, and seals as well as the many fishing fleets are a few sites seen from this charming beach home. This is a great place for dip-netting season; view the fishing taking place from the comfort of home, or take a short walk down to the mouth of the river and be in the center of it all. Historical Old Town is a walk back in time. The Kenai Visitors Natural History Museum, open-air Saturday Market, and many places to eat are all within walking distance. 2017 remodeled 1800 sq ft home located in Old Town Kenai. Seated 25 feet from the bluff with a 180° view of the Cook Inlet’s beach and mouth of the Kenai River. Perfect for Dip-netting season fishers or for those who simply enjoy strolls on the beach and beautiful scenery. 3 Bedrooms and a Loft room (altogether sleeps 10 adults comfortably in beds; we do not charge extra for those willing to sleep on pull out beds, recliners and such). Playpen and Bassinet provided for children if needed. Fish carcasses are to be disposed of in the water at the beach. Once processing your catch, this must not be done inside the home; processing is to be done outside the home only. A fish-cutting table, fish tray, and running water (located outside) is provided for processing. Fish may be brought inside only for use of the chest freezer or cooking. Indication that the processing of fish has taken place inside the home may put your deposit at risk. Written by Tim Wisniewski (owner): We’ve lived in Kenai for 40 years and call this home. We’ve raised our four children here and are very fortunate that they all still live in Alaska. We’ve had the good fortune to be able to start and grow our businesses here, which we still run today. My wife and I met here in Kenai, AK, and have been married 36 years; we've never entertained the idea of moving anywhere else. We enjoy everything that Alaska has to offer and are totally acclimated to our simple, slower-pace life which doesn't include traffic jams. We have witnessed much growth in Kenai, but unfortunately some of the history is slowly disappearing. When we found out that the Petersen home (original builder) was for sale, we became more interested, hoping to preserve it’s history. Our offer was accepted and the real work began trying to restore this beautiful building. We are most proud of what’s come to be and only hope that you come to enjoy it as well. This home depicts the true pioneer spirit of what people had done before any modern infrastructure appeared in Alaska. Take a good look at the hand-hewn, dovetail logs and ask yourself if this was even possible with no motorized tools. The house sits on one of the most beautiful, unobstructed views in Downtown Old Kenai, not to mention that it's the best location for dip netting in July. Needless to say, you'll be impressed. A shower chair is provided for the main bathroom (handicap accessible) when needed. View of the Cook Inlet beach. Path down to the beach is 30 yards from the home. Large TV on wall, 2 Reclining Couches, 2 Reclining chairs (seats 8 comfortably). Ottoman that folds out into a single bed (2). TVs in all bedrooms and the living area. There is no VHS or DVD players provided at this time. Various toys for children. Boardgames provided. Request specific items needed. The bottom floor is wheelchair accessible. The downstairs bathroom has handicap handle bars around the toilet. The bath/shower is not handicap accessible, but a shower chair can be provided. Table for cleaning fish is provided. Large freezer is provided. Fire Pit and 6 outdoor chairs are provided. Picnic table provided. Deep Fryer provided. This was our second stay and we will continue to stay here any time we travel to Kenai. This is an amazing home with everything you could possibly want, including the best view. It’s very easy to work with the owners/property managers and they are quick to respond to all questions. Should an issue arise, they fix it immediately. We will be back! Thanks again for your awesome home. We really enjoyed our stay. It has an amazing view! We had a really amazing stay!! We enjoyed the sunset, took moonlight beach walks and overall had a great experience in this rental. The hosts have done an incredible job! The house is better in person then the pictures. Great view and everything you could need in the kitchen! This home is absolutely beautiful and the views can’t be beat! No one wanted to leave. The home had everything we needed plus some. We even were able to have a campfire, use the boots to go play in the mud, and the chest freezer kept our fish frozen until we were ready to head home. The house was also only ten minutes from where we met our fishing guide and a two minute walk to an adorable coffee shop which were added bonuses. We hope to be back and would recommend this home to everyone coming to this area. Thank you for everything! This place was perfect for our family group of 10 attending a wedding in the area. The views are fabulous and we enjoyed the fire pit in the evening. Even though there were so many of us--all adults--the place never felt crowded. It was well stocked and our only problem was that we could not spend more time there. Old Town Kenai is rich in history. As the City of Kenai recommends, consider taking a walking tour of Old Town Kenai. You can get a map at the Kenai Chamber of Commerce and Visitors’ Center to locate some of the highlights. The Visitors' Center is a 0.3 mile walk from the beach home. Standard rate pricing (September thru May) allows for minimum 1-night stays on nights Sunday through Thursday only. Nights Friday and Saturday require a 2-night minimum stay for Standard rate pricing. A tax rate of 6% will be collected to a maximum of 30$ per stay.